Most freeways are part of the Interstate Highway System, whose purpose when originally conceived was to aid interstate commerce and national defense. Today they mostly serve commuting needs, and that is why they have been expanded and expanded and expanded. Freeway expansions do not reduce congestion, they induce traffic and maintain or worsen congestion. How big does Interstate 5 need to be? Look north and south, beyond the areas of suburbanization, it is 4 lanes. So to carry the true long-distance traffic, we need 4 lanes. At the Capitol Mall overcrossing, it is 10 lanes, an excess of 6 lanes. Interstate 80? To the east it is 4 lanes, to the west 6 lanes, so let’s be generous and say that 6 are needed. At the Madison Avenue overcrossing, it is 12 lanes, an excess of 6 lanes. Highway 50? To the east beyond the rural suburbanization of El Dorado County, it is 2 lanes, so we need 2 lanes. At Sunrise Blvd, it is 8 lanes, an excess of 6 lanes. Capital City Freeway? It’s only long distance purpose is to connect I-80 to US 99, so 2 lanes would be sufficient, therefore an excess of 4 lanes. My proposal is to reduce the freeways back to what is needed for long distance travel. At only two lanes, I-5 could easily be decked so that Sacramento was again connected to its waterfront and not cut off by the Berlin wall of the interstate. 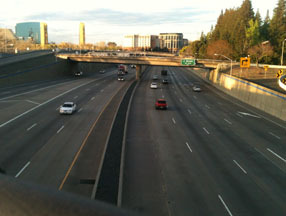 The Capital City Freeway is probably not needed at all, and could be removed, reconnecting Sacramento and east Sacramento. Of course narrowing these freeways, and decking Interstate 5, would cost a lot of money. I think it is a good investment. The value of the land freed up for infill development would cover a portion of the cost. Can you imagine an entire block of developable property along the lengths of Interstate 5, Highway 50, and Capital City Freeway that run through downtown/midtown? That’s a lot of value! There is precedence for such freeway removal or reduction. San Francisco has removed one freeway (Embarcadero) and sections of another (Central), and is talking about removing sections of I-280. The freeways were damaged in an earthquake, but the decision to not rebuild them was an intentional one. Removal increased livability and economic value, and remarkably, traffic flow. Of course land in San Francisco has a much higher value than in Sacramento, so the removal had a greater economic impact, but the principle is the same. Many other major cities have removed freeways. In Sacramento, there is discussion of removing the onramp from I Street to Interstate 5 northbound. Though a minor detail to my large-scale proposal, this one does point out the incredible benefits of removal. Once the streets of downtown/midtown have been returned to a livable, walkable, bikeable, and safe condition, the logical next step is the removal or reduction of freeways.